While it seems that the bonfire custom as we know it is in danger of ending, change is nothing new to this tradition. The bonfire tradition continued to develop as William Heneage Legge, the Sixth Earl of Dartmouth, visited the College in the early 1900s. Students marched around the Green with the bonfire at the center, hoping to make a lasting impression on the Earl. Beginning in the early 1950s, the College scheduled the Dartmouth Night bonfire and the Homecoming football game to occur on the same weekend. Dartmouth Night was then officially dubbed “Homecoming” in 1961. While recent years have seen new safety and security concerns surrounding the bonfire, Homecoming has had a history of issues. The 1950 Homecoming fire was ignited by a student 24 hours before the event was intended to begin. By the time the fire was put out that night, the structure was merely debris. In response, 200 Dartmouth students rebuilt the hexagonal structure with wooden railroad ties, working until early morning the next day. The rallying of the student body to reconstruct the bonfire moved the College to allow students help build the structure after that year. While the tradition had been to erect a structure the same number of tiers as the freshman class’s graduating year, the Dartmouth class of 1979 decided to build a 100-tier structure. The resulting bonfire was so hot that it drove students and alumni alike off the Green. The College consequently imposed a new height limit and a redesign of the structure for future years. In 1988, the College decided to limit the height of the structure to 60 feet and transition to using eco-friendly wood. The creosote-soaked railroad ties were replaced with environmentally friendlier newly cut timber. Yet when the structure was lit on Homecoming night, it did not burn. The Dartmouth reported the next morning that the structure was still standing completely sound. The bonfire’s three-tiered geometric structure did not change between 1995 and 2015, according to Douglas Van Citters ’99, the engineering professor who led the team redesigning this year’s bonfire. However, following the 1999 incident at Texas A&M University where 12 students were killed and 27 students were injured by a collapsed bonfire, the College limited the number of students allowed to assist with the construction. According to Van Citters, the biggest change to the bonfire that occurred between 1995 and 2015, was the “freshmen sweep” before the event. Vice president of alumni relations Cheryl Bascomb ’82 said the biggest change she has seen in the last decade has been the increased access to the bonfire for alumni through pictures or livestreams. “Through technology, alumni who can’t physically get back [to Hanover] can still experience [the Bonfire],” she said. One of the newest changes over the past few decades has been the student-initiated tradition of freshmen attempting to touch the bonfire. Since the ’90s, the College has seen an increase in the number of students trying to touch the fire and avoid the title of “worst class ever” by the upperclassmen. During the 2016 Homecoming bonfire, the volume of students charging the fire was so great that a portion of the fire was extinguished early. During last year’s Homecoming, the College erected a fence to prevent students from running toward the fire. In spite of the barrier, there were seven attempts to jump the fence and touch the fire. This year’s bonfire will see two major changes. The first is the redesigned bonfire structure. The town was concerned that when the bonfire falls sideways, it can potentially fall on either the Safety and Security officers or the students, according to Van Citters. In response, he and a team of engineers and students redesigned the 2018 bonfire to be slightly wider, a few feet shorter, and have a different center of mass to fall inwards instead of sideways. The structure is made with the same amount of wood as in the last 20 years, Citters said. The second change is the implementation of a fence at the end of the ring of the bonfire preventing students from running more than one lap. “Running around leads to situations where there may be mob mentality or the inability to track students trying to run into the fire and touch the fire,” he said. After running one lap, the freshmen will be funneled in front of Dartmouth Hall to take a class photo and watch the fire burn. While many aspects of the Homecoming tradition will be maintained, the Dartmouth administration had made clear that any attempts to touch the fire this year will end the bonfire tradition for future classes. While Sam Selleck ’22 said he was disheartened by the limitations on running around the fire, he is optimistic that this event will be a unifying event for his class. 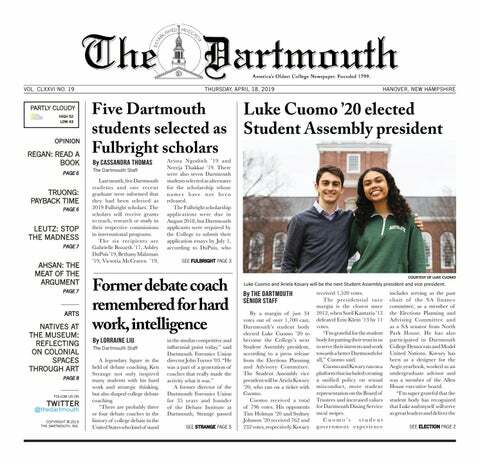 Associate dean for student life Eric Ramsey said he believes the Dartmouth spirit of Homecoming means something different to every person on campus. It is clear that the bonfire tradition will continue to grow and change. However, to most, this tradition is not about the bonfire, or the parade, or the speeches. It is about celebrating the Dartmouth spirit with classmates and alumni.